This was my first Kauni project, I think it turned out well. I made some modifications to this pattern. Increases were done as yarnovers instead of m1 after the first section, I did six sections not five because I had 150g of yarn, and I added 6/0 beads in the last ruffle section. The beads are gold-lined matte AB blue from a local bead shop that match one of the yarn shades exactly. I put in four rows of beads in the final ruffle, offset from each other. I also made the final ruffle smaller by casting off on the ninth row, and I had less than a yard of yarn leftover when I cast off. I had some Shetland sport weight yarn on hand in case I ran out during the cast off, but it was a very different shade of blue. For a simple pattern, I had to rip out a lot, because mis-placed yarnovers looked really bad. For the sixth set of increases, I stopped counting and placed them as close to the previous set of increases as possible. 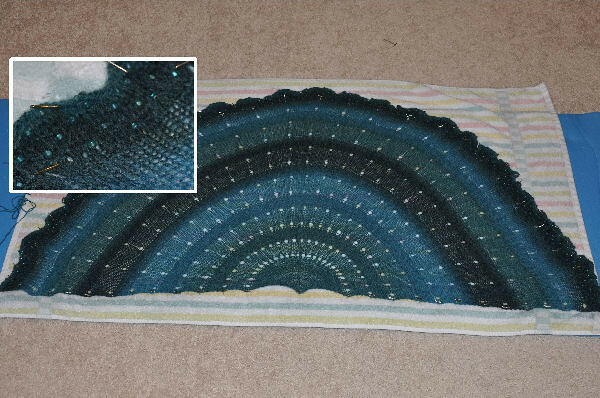 I rinsed this with a cup of vinegar in a sinkful of water before the Eucalan rinse and it’s slightly softer, but I’d still want a shirt between my skin and this shawl. It looks great, especially the beads! I really love those colors! It’s beautiful. I love your mods – I’d skipped over the original pattern because it just didn’t draw me, but I may take another look now. Got to love those close calls with the yardage! It is lovely! Thanks for all of the details on your mods. I always enjoy reading those to see how people personalize patterns.